Often a by-product of the rendering of lard, it is also a way of making even the tough skin of a pig edible. In many ancient cultures, animal fats were the only way of obtaining oil for cooking and it was common in many people's diet until the industrial revolution made vegetable oils more common and more affordable. Microwavable pork rinds are sold which are microwaved in bags that resemble microwave popcorn and can be eaten still warm. Pickled pork rinds, on the other hand, are often enjoyed refrigerated and cold. Unlike the crisp and fluffy texture of fried pork rinds, pickled pork rinds are very rich and buttery, much like foie gras. 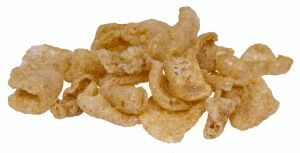 For the large scale production of commercial pork rinds, frozen, dried pork skin pellets are used. They are first rehydrated in water with added flavouring, and then fried in pork fat at 200-210 degrees Celsius. Cooking makes the rinds expand and float on the oil surface. The rinds are then removed from the fat, flavoured and air dried. Antioxidants may be added to improve stability.